I love little boys in ties. I love them in ties even more when they are in cool funky fabrics. I love them in ties EVEN MORE when they are easy to get on ha! A while back I posted a tutorial on how to make a velcro on little boys necktie. It was at the point in blogging though when I didn't know how to make digital patterns. I know my instructions for cutting the ties were not perfect so in order to facilitate a lot more tie making I made a downloadable pattern which can be found HERE. With so many fun holiday parties coming up I wanted to make sure you could easily make a tie for every occasion! So print it out and follow the same instructions from THIS tutorial and off you go! If you don't feel like sewing your own, or you want a cool presie for a friend then this is the post for you! 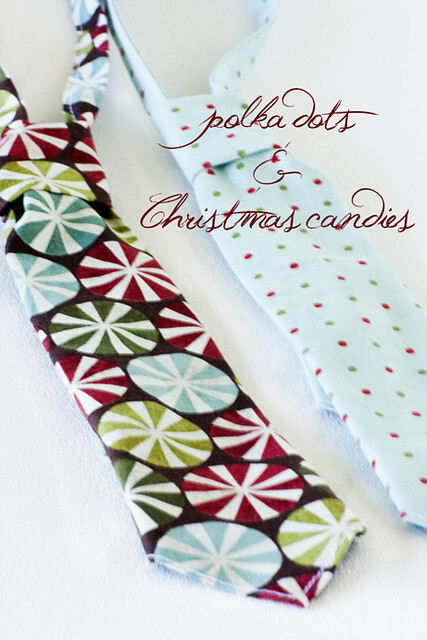 I am giving away 2 of the four holiday neck ties I made for the boys because, well, um we don't even have a reason to have them wear ONE holiday necktie let alone four ha! I do want this to get to you in time to actually be worn so this is going to be a quick giveaway. All you have to do to enter is post a comment and your email (so I can bug you immediately for your mailing address). They will come all wrapped in fun holiday wrapping ready to rip open and wear or give away! Now as for the Merry and Bright dress. The pattern is now available HERE (I was in an odd mood when I made it and instead of simply calling it the purple dress files I called it "Robe Violette" which means purple dress in French.I know.... I am odd) I am going to have a FULL tutorial posted on how to tape together and cut out the pattern followed by the sewing tutorial. I know like 18 pages seems daunting but it is just because the pieces are long. You can totally do it. Just breathe. Also I would like the dress to be popped in the mail this week so I am going to cut the time by one day. I know I am awful but I kinda think all the people who are going to enter have ha! Please feel free to print out the pattern but I encourage you to wait until the tutorial to cut it out. There are some tricks wink wink. These little ties are so precious! We are so excited for Christmas - our tree is already up and I finished shopping for my 8 month old son before Halloween was even over! Thanks for the inspiration! my cousin's little boy would look so cute in this tie! I love, love, love these. How exciting for 2 then each of my boys will have one. I am so thankful that you give patterns and tutorial because even if I don't win I still do!!!! I think more than my teeth would ache seeing my little man in a tie! Would love to win these! Thanks for the give-away and your wonderful blog! SO SO SO CUTE! I usually just want to eat my little guy up and with that tie on he'd be irresistable! So cute! I know a little boy that would look so cute in one of these!! So Awesome! My son would look so handsome this holiday season!! My two boys would look so cute! So excited!!! I love the fabrics. My son is always asking to wear a tie like his daddy so one of these would be perfect! my 7 yr will only wear ties to church (no golf shirts) because he likes to make the girls happy! now my 10 yr old...he is my golf shirt boy. So cute! My nephews would look adorable with them on! I love them! Would make someone look quite handsome here! 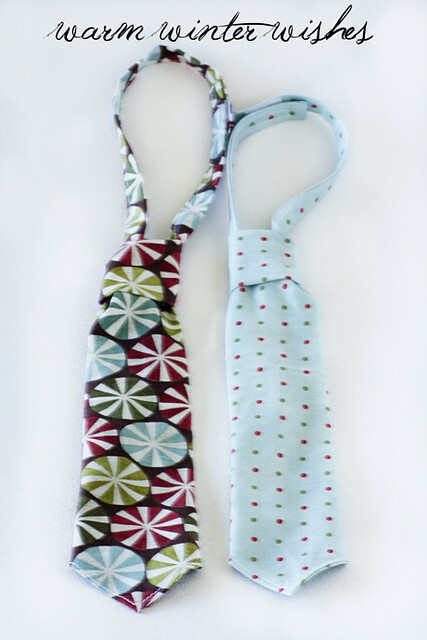 I love the ties- they would be perfect for my little guy! I love these ties! I have two little boys who would look scrumptious in them! Cute ties! One of my two boys could wear one of them this year! So cute! My Wild Thing would dress up nicely in a holiday tie! Awe, perfect for my little man! Oh my goodness, how adorable! I was shocked to see the fabric on the left (Figgy Pudding by Moda) because I'm at this very second sewing a Christmas quilt for my mom out of this fabric. I would love to take pictures of my little boy with the quilt. Adorable! Love the ties. I know 2 little boys that would look dashing in them. my cousins have 3 little boys between the 2 of them, i know they would love these! I could make good use out of these! Too precious! You are so talented! I totally voted for your dress at Sew Much Ado, cause I LOVE it! How are things going over on your end of the world? I would also love to win the ties! Love it! I hope I win. I'd love to get one! Last year I bought my little boy a "real" tie--so cute but such a pain to tie! I have two little boys that would look so cute in those ties! CUTE!! My two boys would look adorable in these. I dont have boys but I know a couple who would look adorable in these. AND I LOVE LOVE LOVE the basic grey fabric! I used that same print as the background for our Christmas cards last year I think...maybe the year before?! Anyways I LOVE it! I have 5 boys and am always in need of a cute tie! Very cute! I would love to give them to my 19 month old nephew. With these ties he would be the cutest toddler around! Adorable. My little guy would look dashing! I absolutely adore these! My little boy would go nuts for one! Sooo cute! These would be a great gift for a friend or my sister...thanks for the chance to win! They are soooo cute! I have three little boys (one who is too little for a tie yet!) and a family wedding to go to before christmas! They'd look perfect on my 2 & 4 year olds with their little vests! Thanks heaps! Love these ties! When you first did the tutorial, I immediately went out and bought a bunch of cute fabrics to make some. I finished one (which my older son wears and loves) but never got around to making the rest. (Little brother is jealous.) I would love to win these, but if not, the winner is gonna love them! I love these! They are adorable!! What great looking ties! I could totally see my little guy in these. A tutorial would be awesome! Great ties! Would love to have one for my little boy. I love those ties! My boys would look darling in them! Very, very cute! In my fave Christmas colors, too! I have five kiddos, four of which are boys. My second son LOVES to wear ties...in fact he left the house this morning wearing a tie over his t-shirt. Very cool!